73 Years Ago Today: “Secret Operation Z”, The Air Strikes on Pearl Harbor. 06:14, Hawaii-Aleutian Time Zone (UTC-10:00), 7 December, 1941; 221 miles north of Oahu in the Pacific Ocean. Navigating through a dark, Pacific morning under strict radio silence the Japanese aircraft carriers Zuikaku, Kaga, Soryu, Hiryu, Shokaku and task force flagship Akagi came about into the wind on mild seas. Deck crews stood ready at the wheel chocks of idling attack aircraft with exhaust flame flickering from their cowlings. Dawn would break in minutes. Communications officers on the high decks changed signal flags to indicate the attack was underway. Chocks were pulled and throttles advanced as 50 Nakajima Kate dive bombers began there short take off rolls from the carrier decks. They were laden with massive, specially designed 1,760-pound armor-piercing bombs. Another 40 Kates carrying top-secret long-finned, shallow water torpedoes thundered forward on the flight deck, drowning out the cries of “Bonzai! Bonzai!” from the deck crew. Secret Operation Z was under way. The Japanese sneak attack on Pearl Harbor. 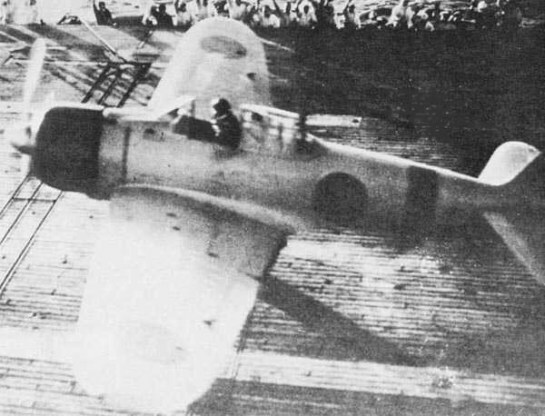 A Mitsubishi A6M2 Model 21 air superiority fighter leaves the deck of the Japanese aircraft carrier Akagi on the way to attack Pearl Harbor. This A6M is lightly armed with two 20 MM cannon and 2 7.7MM machine guns used for strafing ground targets. The Japanese attack on Pearl Harbor remains one of the most successful combat operations in history. Achieved with total surprise after maintaining strict security a massive naval armada of over 60 total Japanese vessels crossed 3000+ miles to stage near simultaneous attacks on multiple targets with miraculous precision and minor losses. The American naval capability was compromised to such a degree that it would take months to mount a tangible offensive in the Pacific. That more Americans did not die at Pearl Harbor is likely a function of the attack coming early on a Sunday morning. Days earlier on November 26 the secret task force had left the covert naval installation at Etorofu Island and sailed over 2100 miles to its “initial point”. On December 2nd they were assembled stealthily under cover of bad weather to begin their final attack run toward the aircraft launch area north of Oahu. Admiral Isoroku Yamamoto, back on mainland Japan, issued a coded radio message via morse, “新高を登る!” or “Climb Mount Niitaka!”. This signaled the attack was to proceed as planned. A new U.S. Army SCR-270 mobile radar array mounted high up Opana Point on Oahu detected the Japanese attack force 70 miles away but believed they were friendly aircraft. At 07:40 local the Japanese attack force spotted the Hawaiian coast at Kakuku Point. They had navigated partially by following the radio transmissions of music from the island. 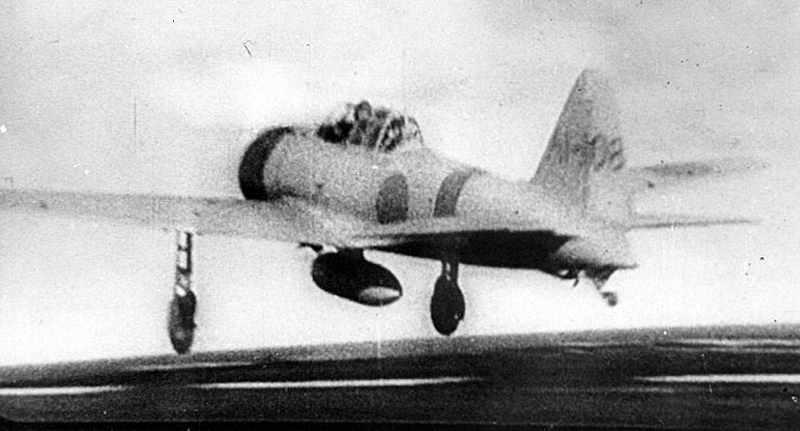 Flight Officer 1st Class Shinpei Sano launches from the flight deck of the Akagi in an A6M2 model 21 Zero after sunrise in the second attack wave. Sano died in the Battle of Midway in June, 1942. The attack began with total surprise and withering precision. Air superiority over Pearl Harbor was quickly established by lightweight, highly maneuverable Japanese A6M2 Zero fighters, the equivalent of today’s F-16. The Americans were unable to mount an effective air defense. As a result, air-attack commander Mitsuo Fuchida transmitted a famous morse radio message in the clear, “トラ,トラ,トラ…” or “To-ra, to-ra, to-ra!”. Fuchida’s torpedo and dive bombers destroyed their targets with impunity as the Americans attempted to mount a defense with anti-aircraft guns. Two ships, the USS Nevada and USS Aylwin were able to start their boilers and run for the channel toward open ocean. Only the Aylwin, staffed by four new junior officers, made it to sea. The Nevada ran aground intentionally in Pearl Harbor after its commander was seriously wounded. The attack on Pearl Harbor was an incredible tactical and strategic success for the Japanese. It put the Americans on the back foot at the beginning of WWII. There were 2,402 Americans killed in the attack. By comparison 2,977 people in the U.S. died in the 9/11 terror attacks. 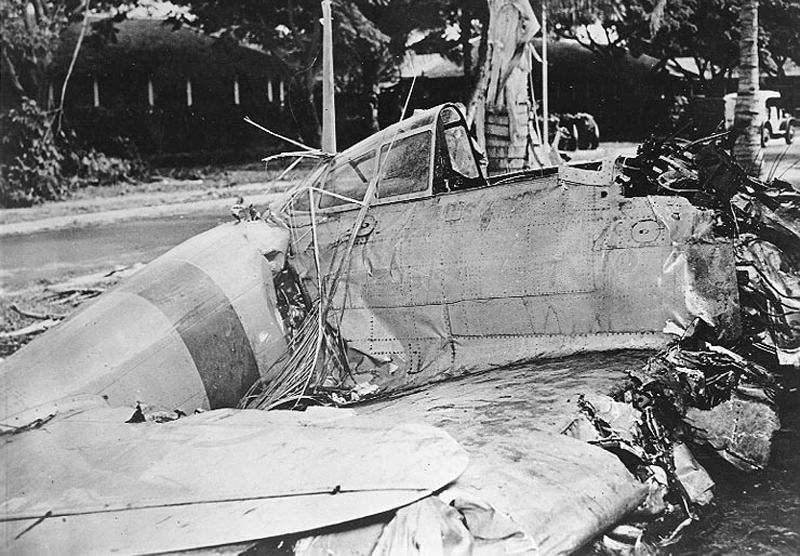 A Japanese Mitsubishi A6M “Type 0” carrier fighter shot down by U.S. forces over Fort Kamehameha, Hawaii on December 7, 194. The social effects of the Pearl Harbor attack touched every American for decades. The Pearl Harbor attack lead to the first and only operational use of nuclear weapons five years later when the U.S. launched nuclear strikes on Hiroshima and Nagasaki. Those attacks combined with a protracted and bloody island hopping, sea battle and air campaign across the Pacific finally brought WWII in the Pacific to an end five years later on August 15, 1945. Remembering the Pearl Harbor attack has become critical to our current political and military doctrine. The Pearl Harbor attack along with the 9/11 terror attacks stand as examples of why the U.S. maintains strategic defensive capabilities and constant surveillance miles from our borders. It has been 73 years ago today since the first bomb fell on Pearl Harbor. The lessons learned from that tragic attack remain as relevant now as today’s headlines. Unless we remember we are condemned to repeat the past. 1 Comment on 73 Years Ago Today: “Secret Operation Z”, The Air Strikes on Pearl Harbor.